British moving image pioneer Malcolm Le Grice revisits two of his early performative works for the launch of Dreamlands: Expanded. In the rarely seen “Principles of Cinematography” (1973) Le Grice reads from Leslie J. Wheeler’s 1953 book of the same name to the accompaniment of projection of clear 16mm film leader. 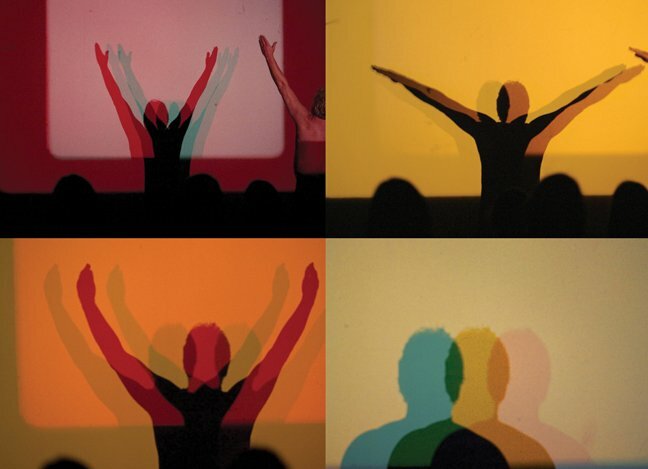 Le Grice also performs his iconic “Horror Film 1” for triple 16mm projection, employing his own body in a shadow play with the superimposed streams of colored light. First performed in 1971, the work was described at the time by Jonas Mekas as “one of his most simple, most classical, and also most ecstatic pieces”. The evening concludes with a Q&A with the artist. Malcolm Le Grice studied painting at the Slade School of Fine Art but began to make film, video and computer works in the mid 1960’s. In his work he has explored the tropes of early cinema, shadow performances, multiple-projection work, digital video and most recently 3D. Le Grice’s work has been shown in major international exhibitions including at the Museum of Modern Art, New York, the Louvre Museum, Paris, and Tate Modern, London. His films and videos are in collections at the Centre Georges Pompidou, the Royal Belgian Film Archive, the National Film Library of Australia, the German Cinematheque Archive and the Archives du Film Experimental D’Avignon. About 80 of his works are held in the Archive of the British Film Institute (BFI). A number of longer films have been transmitted on British TV, including “Finnegans Chin”, “Sketches for a Sensual Philosophy” and “Chronos Fragmented”. An early chair of the London Film-makers’ Coop in 1968, Le Grice has written critical and theoretical work on avant-garde cinema including “Abstract Film and Beyond” (1977, Studio Vista and MIT) and a regular column for the art monthly Studio International in the 70’s. In 2015 Les Presses du réel published an extensive book on his oeuvre titled “Le Temps des images”. Le Grice remains a Professor Emeritus of the University of the Arts London where with David Curtis he co-directed the British Artists Film and Video Study Collection. Lead Underwriting Support Provided by the Robert D. Bielecki Foundation. Generous Support provided by J.J. Kasper, Paul Jost, and Natasha Reatig. This presentation is made possible in part with public funds from the New York State Council of the Arts’ Electronic Media & Film Presentation Funds grant program, administered by The ARTS Council of the Southern Finger Lakes. Microscope Gallery Event Series is sponsored, in part, by the Greater New York Arts Development Fund of the New York City Department of Cultural Affairs, administered by Brooklyn Arts Council (BAC). Additional Support provided by Knockdown Center and Negativland. Sponsored by Colorlab and The Bodega. Official Media Partner: The Brooklyn Rail.